Most of you are aware that Heritage UU Church has an ongoing relationship with Inter Parish Ministry. But for those who are not fully knowledgeable of that relationship, perhaps it is time to review what IPM is and how we support their efforts. 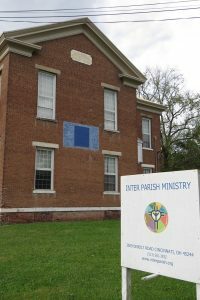 Inter Parish Ministry was founded in 1964 with the purpose of providing food, clothing and some social services to residents of eastern Hamilton County and all of Clermont County. It was originally started with the support of a number of churches in that geographic area. The IPM food pantry and offices have been located on Debolt Road in Newtown for many years after starting out as a storefront operation. Recently, some significant changes have been made at IPM. Well over a year ago, a second store was opened just off Ohio Pike in Amelia. Hours of service were altered and now clients can shop at the Newtown site from 10:00 to 2:00 on Monday, Tuesday and Wednesday. The pantry in Amelia is open to serve client needs at the same hours on Wednesday, Thursday and Friday. Additionally, the Newtown store is open from 6:00 to 8:00 on Monday evening. Another change was brought about by the retirement of Lindsay Ein, the Director of IPM for many years. She was replaced last fall by Katie Brass who came from a Northern Kentucky non-profit. In the past, families served by IPM were allowed to shop at the store once every three months. However, at the beginning of 2018, that policy was changed to allow families to come every 30 days. It is hoped this change will allow families in dire need to obtain the food necessary to maintain a healthy diet. Last year, IPM served over 4,300 families and this number is expected to rise significantly in 2018. As a social justice advocate and an associate of Heritage UU Church, how can you help? There are a number of ways. Several of our church members serve as regular volunteers at IPM. Volunteer activities may include assisting clients as they shop for food and clothing; stocking shelves and sorting food donations; covering the office by answering phones and greeting visitors; and helping during the many special events that are held throughout the year. If you are interested in volunteering, contact Carol Rountree at 513-561-3932. Also, once a month, our Sunday collection is donated to IPM. Your generous support of this act of giving allows the staff at IPM to better service the needs of its clients in a variety of ways. Also, our church happily accepts food and clothing donations. All donations may be placed in the grocery cart located in the Great Hall of the church. These are taken weekly to IPM for distribution to clients. A big Thank You goes to all of our Heritage UU family for the fantastic support given to IPM over the last decade.